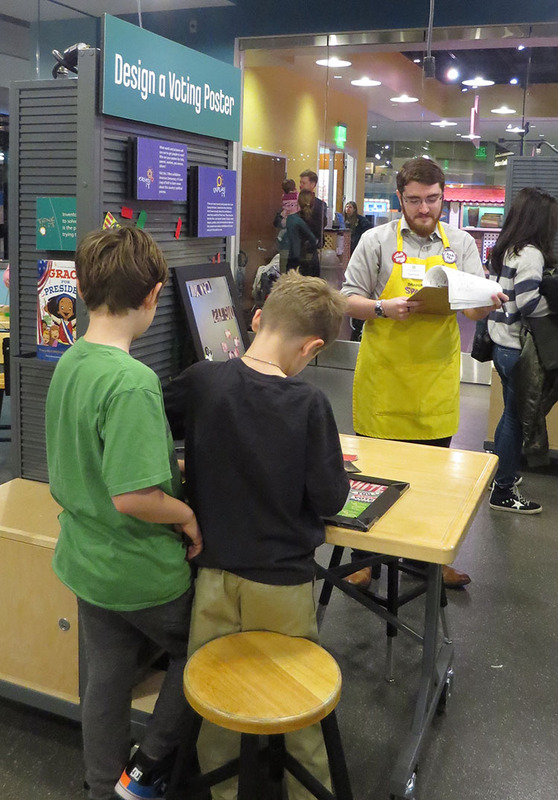 “Are visitors combining materials creatively?” “Are the stations fun for kids?” “Do people view themselves as inventors?” Museum professionals try to find answers to these and other questions using empirical evidence. In turn, we note what works and what we can improve. In Spark!Lab, we refine the very tools we use to evaluate inventive thinking. In doing so, we’re modeling the invention process ourselves. I don’t really think of myself as a scientist, but gathering data is a big part of my job. After all, as we develop exhibitions, shouldn’t we look at how they serve visitors’ needs? When we launched Draper Spark!Lab in summer 2015, we weren’t sure how visitors would respond to our hands-on learning activities. All we wanted to know was how we were doing so we could build better activities in the future. So we put out comment cards (see above) for visitors to fill out. Meanwhile, we started collecting basic data. What do kids choose to do in the room? How do helpers wearing yellow aprons engage caregivers? How do people feel about the experience as a whole? Just like inventors, we eventually needed to tweak our methods. As we conducted more evaluations, it became clear we needed to focus on observing specific behaviors—the ones we had found most relevant to improving the Spark!Lab experience. This meant altering our instruments. In fact, we essentially combined three sheets of paper we had been using into one master data collection form! As part-time staff, this was the first time we had made an evaluation form for use in the exhibition. We had invented an original instrument ourselves! It addressed relevant needs, and it was an improvement over what we had, so it provided us with a great sense of pride and ownership. Using this tool, we took notes and soon had an absolute wealth of qualitative data. Using these observations, we could compose narratives of what visitors typically experienced at each activity station. Within the same, elegant worksheet, we made tallies each time we observed visitors practicing the invention process. Once we analyzed this quantitative data, we added that to our visitor stories. The results were sophisticated. We could now produce comprehensive reports to help the rest of the Spark!Lab team see what happened on the floor, informing the team’s decision making. As I always say to kids, however, an inventor’s work is never truly done. The new problem? We realized there was too much writing involved! As we filled out the form, we had no time to look up and catch what was happening at the activity station. It also took too much time to record all the observations in increasingly detailed reports. We had to tweak our evaluation instrument again. We needed to create something that could collect data quickly so we could respond to visitors’ needs with timely activity improvements. We rebuilt the tool. We streamlined some sections and combined other parts. We gutted still others entirely. We used numbers to track visitor behavior instead of writing paragraphs. It worked! We collected data so effectively, we began to amass a pool of data that would allow us to understand the effectiveness of the activities over time. With fewer staff this past year, other priorities superseded evaluation. But now that our staffing needs are met, we have a chance not only to observe visitors but also to rethink our evaluation approach once more. Meanwhile, we will keep in mind all the lessons we have learned from inventing evaluation instruments and will keep iterating our process. Draper Spark!Lab is located on the first floor, west wing, of the National Museum of American History in Washington, DC. It is open from 10 a.m. to 4 p.m. every day except Tuesdays and December 25. For more information, visit  https://invention.si.edu/about-sparklab.